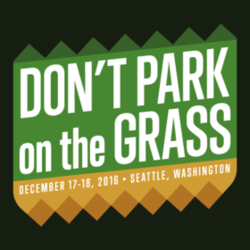 Don't Park on the Grass was a national tournament held in Seattle, Washington, during December 17th-18th, 2016. It was the largest event thus far held in the Pacific Northwest region, and hosted both singles and doubles tournaments for Super Smash Bros., Super Smash Bros. Melee, and Super Smash Bros. for Wii U. It was also one of the largest Melee tournaments of all time, boasting 640 entrants, and stands as the second largest two-day Melee tournament ever, behind Pound 2016. Don't Park on the Grass was the first national tournament where Hitbox's SmashBox was legal. This page was last edited on March 30, 2019, at 19:56.